UNLOCKED PROTRADER: What did we miss? We are two weeks from Pro Tour Ixalan, and that’s going to offer some very interesting price changes. At least, that’s my hope. I really want something to dethrone Temur Energy, but the deck is consistent and powerful. Silver bullets are few and far between in Magic. Before we get to the PT, though, I want to take a moment and acknowledge some lessons that we’ve all had to learn in terms of the prices of Ixalan cards. There’s a handful of cards that preordered for low prices and have spiked, hard, into two or three times the value. What should we have learned from these cards? Why didn’t we see this coming? How can we apply these ideas to future sets? Vraska’s Contempt is good, but at four mana, it might be too much. Hero’s Downfall was super powerful, and the Contempt will see play as an answer to the indestructible/recurring Gods, but oh it stings. I don’t think Contempt will be a four-of, and that’ll keep the price reasonable. What I predicted was true in terms of the numbers: Very few decks have the full four as part of the 75, and they are tending to start with three in the main. What I was wrong about was the popularity of control decks, even though there were a lot of Approach of the Second Sun decks running around. I simply underestimated the prevalence of control, a theme we will return to. I have to admit, this one hurts the most. I knew that The Scarab God and Hazoret the Fervent are two cards helping define this format, and this card deals with both at instant speed. I should have seen this as a more expensive card. I made money off of Hero’s Downfall being positioned well! I missed out on the confluence of casual demand for lands that make tokens, and Anointed Procession decks in Standard. I knew that Procession was a strategy, and had a lot of enablers, but I didn’t give enough credit. It’s not like this card spiked all the way to $10 or $15, but it does have enough interest to be worth a lot more than its preorder price. Hostage Taker ($5 to $15) – When a rare is preordering for a few bucks, my thought is often “Well, we are going to open a lot of these packs and that price should hold.” For most rares, that’s true. For this Pirate, though, I just overlooked the smell of pure value. How amazingly powerful it is to remove a creature by playing a creature of your own. This card allows you to get even more value by getting the creature for myself! It requires an answer immediately or it’ll get to cast the stolen card! It’s also a fantastic answer to the two Gods mentioned before, especially if you get to steal it! I thought of this as a Cast Out/Oblivion Ring sort of card, which was a gross understatement of the card’s power. Mea culpa. Search for Azcanta ($4.50 to $14) – Remember how I said I underestimated control decks? Here’s the other card I just whiffed on. It’s a terrifying way to fuel the control player’s hand, but there’s layers on top of that. The card is only two mana to get going. Legion’s Landing is the same way, being cheap to come down and flip relatively quickly. That’s important, because these legendary enchantments are low-impact when they come down. The card also is a form of ramp spell, because about turn four or five it’s going to become an extra land. This means Fumigate or Approach happens a turn earlier, a payoff that’s worth striving for. I truly underestimated how well it plays with Approach, digging you to the win a lot sooner, and also how you can have a Search for Azcanta in play and choose not to flip it! 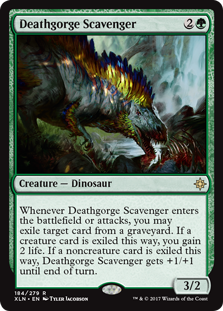 Deathgorge Scavenger ($2 to $6): We are really short on effective ways to deal with stuff in the graveyard in Standard, and that’s a big part of why The Scarab God is tearing up the format. Until this dinosaur came along, we needed to exile creatures immediately, because the graveyard was a pretty safe space, difficult to interact with. Answers like Scarab Feast or Sentinel Totem are too focused, but this creature gives you an immediate effect, and a bonus couple of life, depending on what you wanted to exile. I didn’t give proper credit to the dire need that decks and for an efficient and effective way to interact with the graveyard, perhaps it had just been so long since I saw one printed. This also fits nicely into one of the more popular decks in the format, the Energy lists. Hopefully, now that I’ve looked at why I missed on these, I’ll be able to keep an eye on things that will play very nicely with Approach of the Second Sun, or deals with indestructible/recursive threats effectively. I’ll also be keeping an eye out for stuff that plays well with the legendary enchantments. For instance, how good is Thought Scour in combination with Approach and Search? Cliff has been playing since Christmas 1994 and the gift of three booster packs in a stocking. Since then, he’s spent a lot of money on cards and made even more, with the goal of always being able to trade for cards instead of buying them. Follow him on Twitter @WordOfCommander or tune in every Friday here at MTGPrice. Lesson number one: When in doubt, go for the dual lands from the first remaining block before rotation occurs. All the fastlands shot up in price silently over the past several weeks (Ex: Botanical sanctum from $4 two weeks ago to over $9 today. Easy logic right there.) Should be added if it’s already not. You’re not wrong about the increase in price for the fastlands, but we want to be careful with that logic in general. 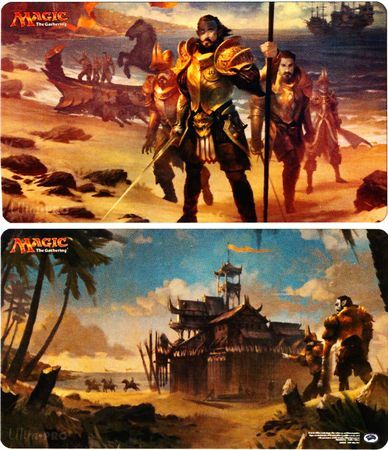 It’s possible that the buddy lands from Ixalan will go up some, but this is their fourth major printing and supply is enormous. My goal here was to look at why I was so wrong about these cards in particular. Contempt, for example. I could have bought a ton on preorder for $3 and be sending those out to a buylist for $7. I just missed, and while there’s no shame in being wrong, I wanted to examine why I missed. Agree somewhat on the check lands. My attention will turn to whatever dual lands we get in Dominaria. If they are not reprints, they are definitely something to look at. This is nowhere near the right spot to post this. I have been a member since August and still have not been sent credentials for the forums (to listen to mtg fast finance). I tried support (twice) I even tried creating a second account. Any chance you can poke whoever needs to be poked to get me said information? Hi Sideshow. Please message @mtgcritic on Twitter and let him know you’re having issues. He can get you straightened out.